Hayes Principal Ric Stranges talks to Emma Klemanski and Hannah Elam, juniors, Friday morning about the culture at Hayes and what they think could improve. Hayes High School will get a visit this October from a group that will determine if Hayes is worthy of the Blue Ribbon of Excellence. Principal Ric Stranges said he arranged the visit and audit after he and several teachers presented at a Blue Ribbon conference in Florida. Stranges said the audit will focus on the following nine areas: student focus and support; school organization and culture; challenging standards and curriculum; active teaching and learning; technology integration; professional community; leadership and educational vitality; school, family, and community partnerships; and indicators of success. “We can continue to say, ‘We are doing good things,’ but if you don’t have an outside audit take a look at what you are doing and what your practices are and validate things you are doing well and identify the things we need to strengthen, then I think we are being shortsighted,” Stranges said. Stranges added he’s excited for the audit because it takes more into account that just test scores. Stranges said the feedback gained from the audit will give him an idea of what changes need to be made at Hayes. Stranges said the community has a lot to gain if the school earns the designation because Realtors and potential families always ask what the schools are like. “To be able to say we’re national recognized I think will benefit many, many people,” Stranges said. Stranges added he’s optimistic about the audit but isn’t afraid to try again if Hayes doesn’t receive the Blue Ribbon of Excellence. Stranges said the school will be doing an internal audit before October and said all the students at Hayes were recently surveyed about the school. He added task forces have been formed to prepare for the audit. Greg White, an American government and economics teacher at Hayes, presented at the conference in Florida and said he’s looking forward to the audit. “We’ll take as much feedback as we can get to make Hayes better,” White said. “It’s the right thing to do for students, staff and the community,” Stranges added. 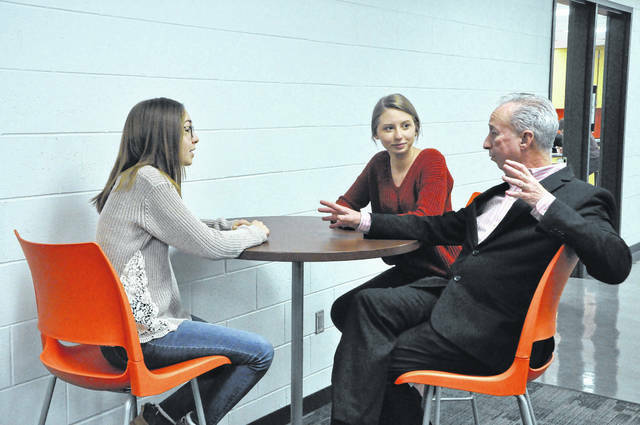 https://www.delgazette.com/wp-content/uploads/sites/40/2018/03/web1_DSC_1237.jpgHayes Principal Ric Stranges talks to Emma Klemanski and Hannah Elam, juniors, Friday morning about the culture at Hayes and what they think could improve.